Ellis Luciano Silas (1885-1972), artist, was born on 13 July 1885 in London, son of Louis Ferdinand Silas, artist and designer, and his wife Letizia Sara, née Paggi, an opera singer. He was educated by private tutors, then worked in his father's studio and studied under the well-known artist Walter Sickert. His main interest became marine art and he painted in English coastal towns before sailing for Australia in 1907. He spent time painting in Sydney, Melbourne and Adelaide before settling in Perth. When war was declared in 1914 Silas, who had served for three years in the Royal Naval Volunteer Reserve, enlisted on 16 October through a strong sense of patriotism, but with grave doubts about his ability to be a successful soldier. He joined the 16th Battalion, Australian Imperial Force, as a private and was made a signaller, although his preferred duty was as a medical orderly. After sailing for Egypt in December, the battalion trained at Heliopolis. Silas found army life extremely distasteful but conscientiously practised signalling and continued sketching and painting whenever he was able. On the evening of 25 April 1915 his unit landed at Gallipoli. Silas served with distinction at Pope's Hill, Quinn's Post and Bloody Angle and recorded his experiences in a detailed diary and sketchbook. Constant duty at the front took its toll and on 28 May he was evacuated from Gallipoli suffering from neurasthenia; after signalling almost continuously for several days he had been found unconscious and delirious and later developed enteric fever. He convalesced in Egypt and England before being discharged from the A.I.F., medically unfit, on 17 August 1916. His book, Crusading at Anzac, based on his diary and sketchbook, was published in 1916. 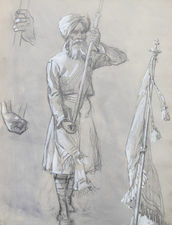 Silas remained in London while awaiting return passage to Australia, executing works depicting his war experiences, three of which were purchased for the Australian War Memorial collection. These were 'The Roll Call', 'The Attack of the 4th Brigade, A.I.F., at Bloody Angle', and 'Digging in at Quinn's Post or The End of a Great Day'. He was one of only three artists to record Australian participation at Gallipoli from first-hand experience and the only one of these to paint battle scenes. He returned to Australia in 1921 and lived in Sydney, working as a commercial artist and contributing articles and cartoons to the Bulletin. In 1922 he travelled to the Trobriand Islands to paint; here he lived in a native village and made a collection of local artefacts, now in the Museum of Mankind, London. His book, A Primitive Arcadia, based on these years, was published in 1926. In 1925 Silas returned to England and continued to work as a marine artist. A large canvas depicting the First Dutch War, 'The Price of Glory', which he had begun in Perth before enlisting, caused a minor sensation at the Royal Academy of Arts in 1934. This work is now in the National Maritime Museum, Greenwich, England. He also illustrated books, designed posters and was commissioned by shipping companies to execute works to hang in their ocean liners. On 23 August 1927 Silas married Ethel Florence Detheridge, known as Daphne, at St Clement Danes Church, London; they had no children. Survived by his wife, he died in London on 2 May 1972.